The Live Oac dock sits on Skull Creek, just past Bluewater Resort and Marina. If you have a larger group, try to carpool, as parking by the dock is limited. When I parked my car, I realized that I completely forgot sunblock. Being a redhead, I had to run into the shop above the dock and purchase a bottle. It’s a good thing to know if you forget anything, the shop has almost everything you could possibly need for a boat tour. I met Captain Scott and Captain Harry before we boarded the boat. Captain Scott has lived on Hilton Head Island for over 14 years with a vast knowledge of Hilton Head and the surrounding islands. Captain Harry is new to Live Oac but has professional experience with Hilton Head’s ecosystem. We boarded the boat and headed out on the Intracoastal Waterway toward the May River, under the bridge that connects Pinckney Island to Hilton Head. We cruised by residential neighborhoods on Jenkins Island and Hilton Head to see the amazing architectural styles of the homes. As we passed by Windmill Harbour, Captain Scott drew our attention to one of only three harbors on the entire East Coast with a Lock System, which is a combination of gates allowing boats to go from one water level to another. The system allows residents to keep their boat just steps away from their home, and provides an added layer of protection and security. We started the tour just after 2 p.m., so that we could see the most action from the dolphins. 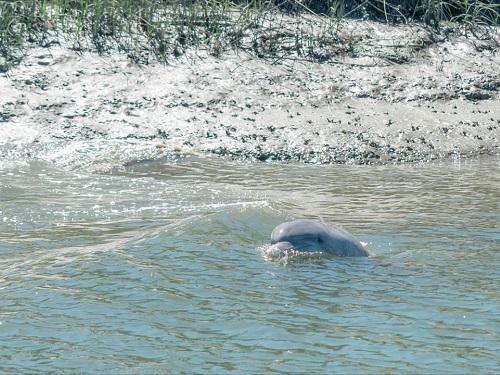 Hilton Head dolphins are a species of bottlenose dolphins, and can consume about 50 pounds of fish per day. Both Captains shared stories about the natural habitats of the dolphins and their unique behaviors. Just after the tide reaches its lowest point, the dolphins come out to feed. Scott pulled the boat into a creek just off Old House Island to see if we could spot any dolphins. One of the only places in the world where dolphins will strand feed is in the Lowcountry, right off the coast of Hilton Head Island. This is a learned behavior that is passed on through generations in this area. Once we located a dolphin, we followed him to his feeding spot. I cannot put into words how amazing it was to see this in action. It was the first time that I had ever seen a dolphin be a mastermind of the ocean by herding these fish and pushing them up on land to catch them. In that moment, you truly get an up close and personal experience with the Lowcountry wildlife. Once they have had their fill, pods of dolphins join together to socialize in the island waters. It’s incredible to see the dolphins swim around and play. This is when you will have the best photo opportunities. It’s a smooth ride back to the dock, but it’s chilly enough to need a light jacket. Captain Scott has a variety of stories about the islands and homes that you will pass by. Once you step back on land, you’ll be ready to book your next tour! This exhilarating tour is the perfect way to spend your afternoon. It’s a fun adventure for the entire family. I can’t wait to bring my friends and family next time they are in town. At the end of the day, you will have plenty of photos of your incredible journey with Live Oac to share with your loved ones. Have you attended a tour with Live Oac? Share your pictures with us on social media!